I bought my red Gregory Chaos backpack at family-owned Casual Adventure inArlington,Virginia. It was the Spring of 1998 and I was preparing for my first independent travel experience, backpacking around Europe after college with a group of my best friends. Until then, my experience sans duffel bag or luggage was limited to a few random hiking and overnight camping trips as a kid. Based on my research (i.e. Reading Rough Guide's First Time Europe), I knew smaller was better. 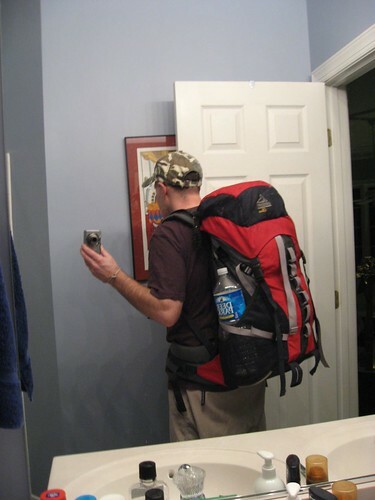 If I limited the size of my pack, I had built-in protection against carrying too heavy a load.I went with a 2,700 cubic inch size because it felt snug next to the curvature of my back. Plus, it seemed to have a strap for every conceivable adjustment, thus keeping me busy for years.The litmus test was whether I could walk into a china shop without destroying the joint. The Chaos was the pack which gave me the most confidence of such success. It was small enough that I've taken it as carry-on luggage on my 3 big trips to-date (1998, 2005, 2006). It cost $180, and represents my greatest travel experiences – past, present and future. On my first day in Paris, my friends and I were clueless and spent countless hours walking all over the city, with our packs on our backs.Parisians looked at us with contempt. Over 49 more days, it accompanied me to Amsterdam, Prague, Venice, Florence, Lake Como, Rome, Nice, Dover, London, all around Ireland, and back home again. Three years later, my brother graduated college, and inspired by my trip (I like to think), he planned a European adventure as well. As the older brother, I lent him my pack.It was tried and true for him as well, experiencing a journey woven into its fabric which I will never know. While I do not have pictures of my brother's trip, I do know he wrote a great account of what it's like to go running with the bulls in Pamplona, Spain! While on hiatus from international travel, my pack served me well on weekend trips fromNew York City to San Francisco. Putting it on means I carry with me my past experiences of adventure, desire, loneliness, camaraderie, hardship and wanderlust.It bears the imprint of airport, train, bus, hovercraft, ferry and hostel floors across the world. My pack fit snug on my back as I walked out of theSan Jose International Airport in Costa Rica, my first Central American adventure, in 2005. On my final night of the trip, I met a Swiss guy who brought his skateboard on a long trip through South and Central America. I envied him for his willingness to lug it around, though wouldn't have trusted my skills at age 28 not to get me injured on the road. My pack was happy to join me on the boats of Belize that shuttle people to the Cays in 2006, soaking in the saltwater mist along the way. And 10 years after I purchased it, my red Gregory Chaos backpack is lying ready under my bed, awaiting its greatest journey yet, a solo circumnavigation of our planet Earth. Does your pack have a story? how.. random! :) I was looking up gregs chaos pack. I too have a red gregory chaos, and its a wonderfull little pack (it would be nicer if it were a pound lighter but! ), mine was bought in London where I lived at the time. I have a bigger gregory which I took when I hiked the Appalachian Trail. My Chaos is also waiting to go back out into the wild yonder. Take care of your chaos! Thanks for leaving the comment on your random drop in to my blog!